Today is officially the first day of fall! 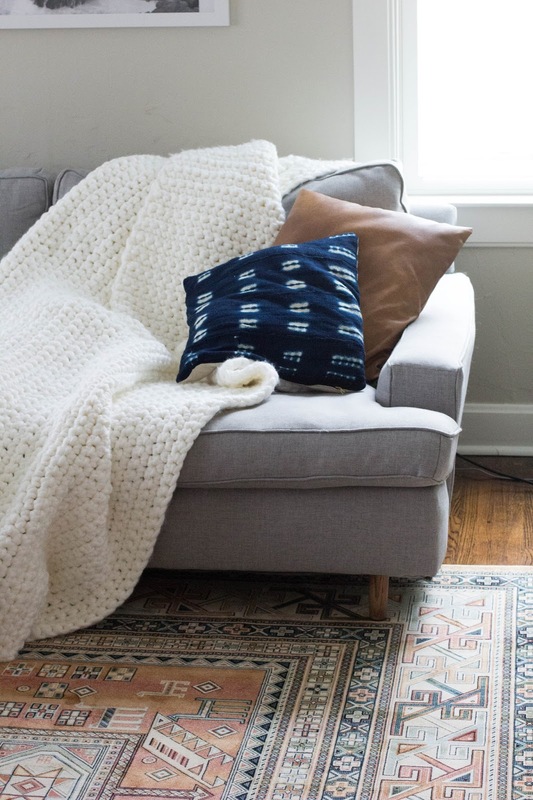 What better time to start on your big crochet project than now?! After I made my chunky crocheted blanket last year, I felt like I hit the jackpot with Loops & Thread's Ginormous Yarn. It came in skeins of 100 yards and I got it all on sale at Michaels. Here is a photo for proof. Unfortunately, it seems they discontinued this yarn and I have searched ALL OVER to find it for you. It is nowhere to be found. I did hear of a reader that found it recently at her closest Michael's, so maybe as the temps drop they will release it! Keep your eyes peeled because this yarn is the best and so inexpensive! Chunky blankets are an investment. This is why you may be shocked at the price of a chunky blanket, but after making my own I completely understand. 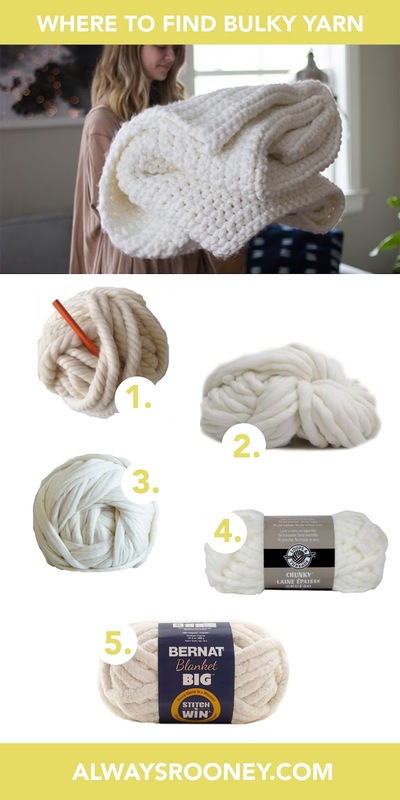 I've rounded up a few sources at the cheapest bulky yarn I could find for you to make your own blanket. If I missed some that you are aware of, please comment and add to the list! 1. I love the texture in this yarn! It only comes in skeins of 14 yards, so keep this in mind when ordering. 2. Comes in skeins of 39 yards. You'll need quite a bit for a large blanket, but the colors are beautiful. 4. This is the closest to the yarn I used for my blanket. In fact, this is what I started using until I found it in bigger skeins labeled as "ginormous". Maybe that is why Loops & Threads discontinued the ginormous, since they knew they would make more off of chunky yarn in smaller skeins? Just a thought..
5. This is a great option for shopping at Michaels so you can use a coupon or take advantage of their sales (that seem to happen all.the.time). The material is more like a baby blanket, but who doesn't want a super soft blanket? Do you have any big knitting or crocheting projects lined up now that it is fall? I'd love to hear about them! I've been searching all over for a super chunky yarn, thanks for the tips! Unfortunately we don't have Michael's here in Europe, but I'll check if I can find some of these brands somewhere. Thanks for sharing! You're welcome! Hope you find what you are looking for! Can you tell me the dimensions of your chunky blanket? And possibly what stitch and size hook you used? Love your blanket! Thanks for sharing.